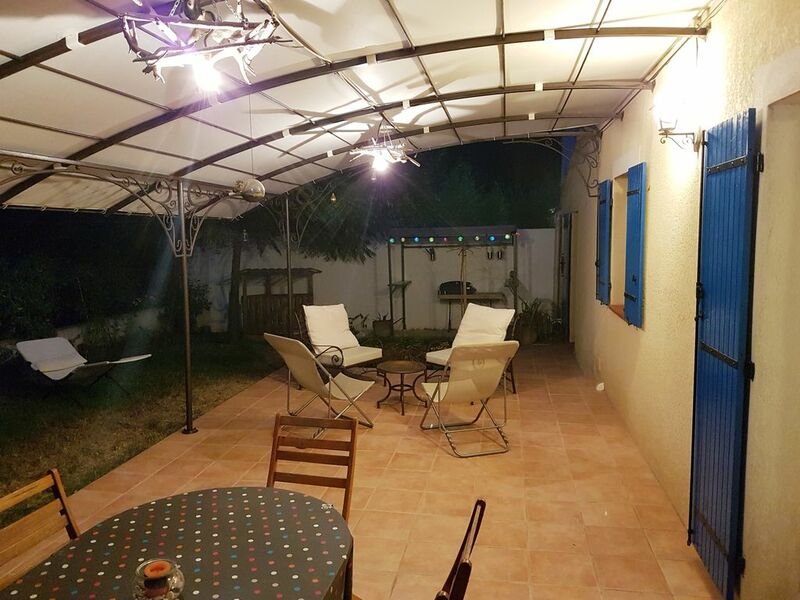 House of 125m ² including a large living room with American kitchen, 3 bedrooms, one with a double bed and two with single beds, a bathroom upstairs and a bathroom downstairs, a large garden and a swimming pool. ground. It is pleasantly arranged with a large living space, an American kitchen, a room office with an elliptical trainer, games for children on the ground floor, toilets on both levels, spacious rooms with mosquito nets, additional sleeping possibilities , a pleasant terrace to the east, a trampoline, a small terrace to the west, a plancha and an above ground pool. The kitchen is equipped (pyrolysis oven, robots, American fridge, dishwasher, small appliances, espresso machine, toaster) a deep fryer and a microwave, the washing machine and vacuum cleaner are in the back kitchen. I supply bed linen; Toilet paper and hand soap are available upon arrival. If you have a baby or a child under 3, we also have a cot, a real baby mattress, and a mosquito net for this bed and a safety barrier for the bed a square. A small host book will explain the basics. Neither dogs nor animals: this is not negotiable. Pour la deuxième fois dans cette location nous sommes toujours aussi satisfaits des prestations. Maison très bien équipée et au calme. Maison très agréable, jolie déco et très propre. Propriétaires accueillants et très à l'écoute de nos besoins. Le plus : les jouets pour les enfants, les propriétaires ayant mis à notre disposition les jouets de leurs enfants les nôtres ce sont régalés!